Major in mechanical engineering and graduated from Ritsumeikan university in Kyoto, he entered the researce institute of Japanese sword on the campus in 1941 and learned under Sakurai Masayuki, the Second son of a famous swordsmith Sakurai Masatsugu. After that he moved to Onomichi city in Hiroshima pref. Masamine was designated one of a preservers of Important Intangible Cultural Assets, popularly known as Living National Treasures in 1981. He passed away in 1998. This sword remind us Kamakura period Ichiminji. The blade is wonderful shape ikubi kissaki Ichimonji srtle. Jigane was made his own tamahagane in his own factory. Hamon is excellent gunome cyoji midare. We recommend this human national treasure sword. Blade length :　74.0　cm or 29.13 inches. Sori : 2.2 cm or 0.86 inches. Width at the hamachi : 3.01 cm or 1.18 inches. Width at the Kissaki : 2.47 cm or 0.97 inches. with deep sori and ookissaki gorgeous style. 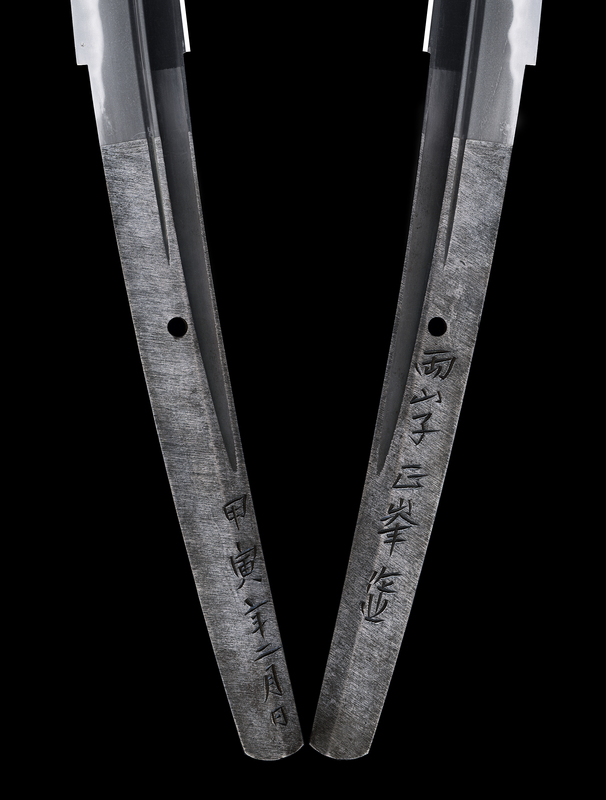 on both sides of the blade, bo-hi is engraved. Jigane :Koitame hada well grained with nice utsuri appear. with thick nioikuchi and turns back.